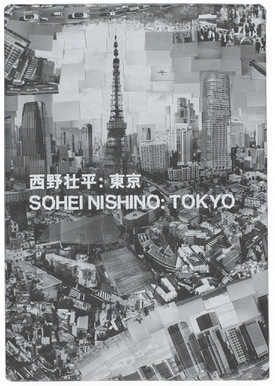 Book Review Tokyo By Sohei Nishino Reviewed by Arista Slater-Sandoval Sohei Nishino will spend an average of three months on location capturing thousands of exposures on 35mm film in vastly different areas of a city. He will then create contact sheets from the film, cut the individual exposures out and reassemble a flexing yet familiar large-scale map of the city. amana, Tokyo, Japan, 2015. 496 pp., 496 illustrations, 5¾x8¼". Cities are motion; buildings go up and come down, shops close and change occupants, people use various methods of transportation from day to day, today there is a parade and tomorrow there will be a street closure. Differing spokes of activity create the dynamic portrait of Tokyo in Sohei Nishino’s first book Tokyo. Short-listed in 2016 for the First Photobook prize by Aperture and Paris Photo, the book dissects the nature of assemblage through a large-scale map of Tokyo created by the photographer. With this dialectic of destruction and regeneration, we see the city ebb and flow through multiple vantage points compressed to one plane. To view the book is to question process itself. Sohei Nishino will spend an average of three months on location capturing thousands of exposures on 35mm film in vastly different areas of a city. He will then create contact sheets from the film, cut the individual exposures out and reassemble a flexing yet familiar large-scale map of the city. The resulting single image composed of thousands of smaller images creates a portrait of place from the memory of the photographer. “A record of how I, as a human being have walked through their streets and how I looked at those street ” — Sohei Nishino. Often focusing on a known landmark, the map will gently spiral out from an obvious city layout to produce pockets of what can be considered street photography. Focusing on smaller sections, we are thrust into the micro and are given a view into daily life and happenings of a city, while still in the presence of its entire map. Tokyo By Sohei Nishino. amana, 2015. Adding to the complexity of this seemingly straightforward process of assemblage is the mix of genera encountered when traveling from page to page. Street and architecture are the obvious first methods presented. However, moving to the corners of the map where vast swaths of gray present themselves as water and sky creates abstraction. The subtle changes in tones create a study in pattern and form.